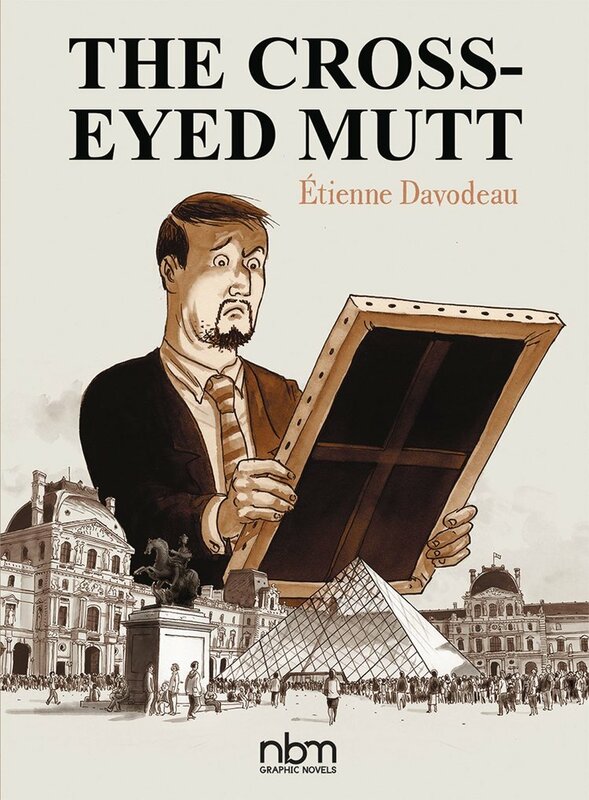 First I wondered if just for people who don’t know about this publishing series or haven’t read them, what is this series of graphic novels from the Musée du Louvre? 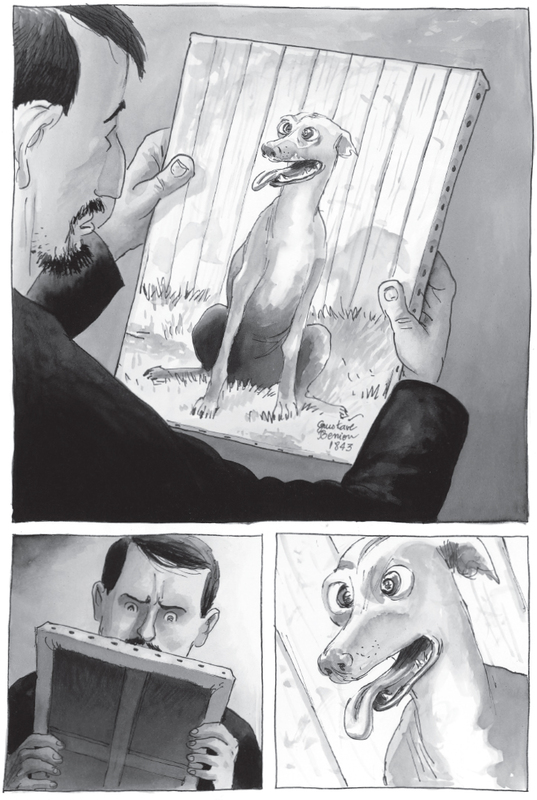 It’s a series of books with a very simple constraint: go into the Louvre and use it as the setting for a graphic novel. A dream come true for an author! 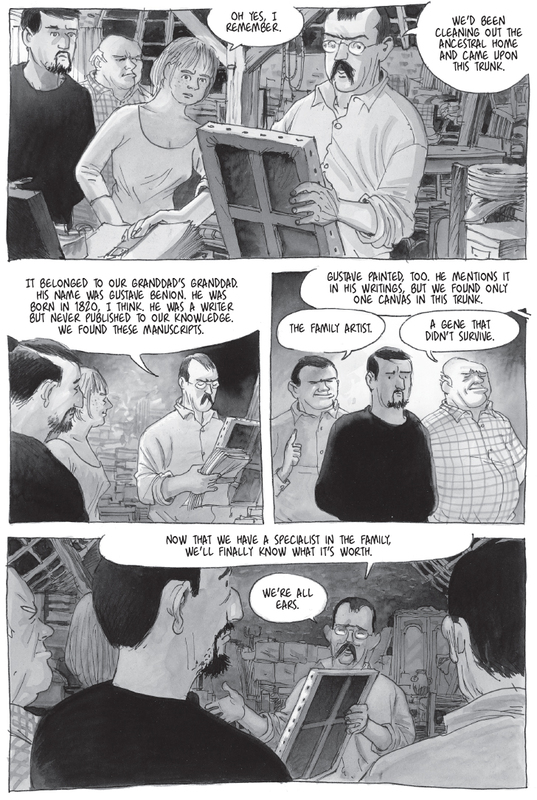 Not to mention, proof that the graphic novel is finally being accepted as an art form worthy of attention from France’s greatest and most official institutions. Doing a comic book in the Louvre would have been totally inconceivable twenty years ago. Early on you show the painting in question, the Cross-Eyed Mutt. Did you debate showing the painting? Or did you want to show that it’s not untalented but it’s just not very good. The idea behind that was to show an anecdotal painting, one that doesn’t hold much interest. Not even anything shocking, which would have made it stand out some. Just a mediocre piece. And I liked the idea of having it (briefly) exhibited in a gallery featuring real and beautiful paintings that also portray scenes from everyday life, like the farmyards of lower income homes in the nineteenth century French countryside. There is a thematic connection with the Cross-Eyed Mutt. And yet the question remains: what are the factors that grant or deny such or such a work entry into the Louvre, which is to say immortality? I do love the Benions and their views on furniture. I have to ask, where did that come from? The Benions are alive and well and very happy with their station in life, which has no relation whatsoever to the art world. They live—as do I!—in a rural part of western France, and when their sister shows up one day with her new boyfriend, a museum guard at the Louvre in Paris, they happily immerse themselves in that world without the slightest bit of self-consciousness. The role they play in my story is also to mock the whole formal, solemn and often intimidating side of the Louvre. They put that aspect of things in perspective. Do security guards really play that game, guessing how long before people ask them? It made me laugh but I remember thinking, I’m sure that happens. I did research for this story by spending a lot of time with actual security guards. This book is a work of fiction, obviously, but when it comes to the work these people do, it’s virtually a documentary. Security guards spend their professional lives in one of the most beautiful places in the world; every year, some 10 million visitors file past them who have come from all over the globe to admire the works of art, the Louvre itself, and the city of Paris. But the guards remain completely invisible. And it’s absolutely true that they get asked the same two questions all the time: “Where’s the Mona Lisa?” and “Where are the restrooms?” These two questions also serve to show the Louvre as just a tourist destination like any other. In the morning, people “do” Euro Disney, and then in the afternoon, they “do” the Louvre. They do it in just two hours, so they’re only interested in seeing the highlights, the collection’s centerpieces. It’s a little depressing, but kind of funny at the same time. How did you end up working on this book? Did they approach you? What made you interested in saying yes? 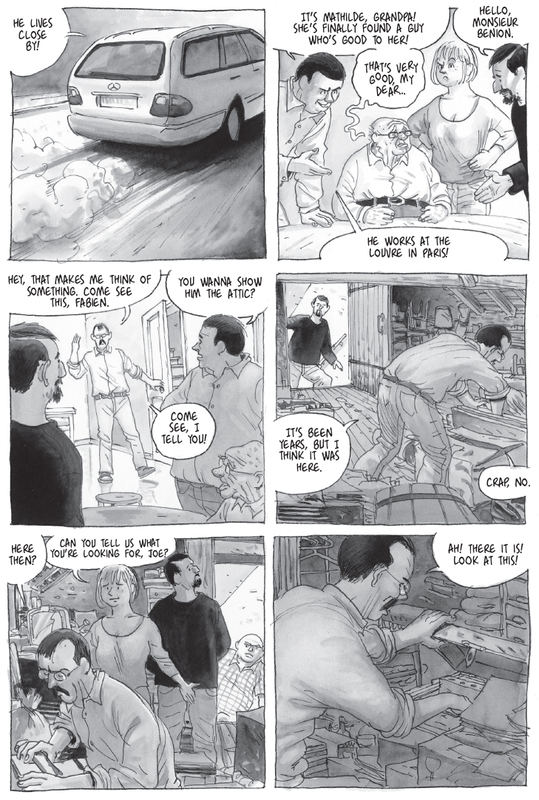 This series was conceived jointly by Futuropolis – my publisher in France – and the Louvre’s publishing imprint. But I specifically approached them and asked to be involved. Having non-stop access to the Louvre for two whole years was like a fantasy to me. Have you ever spent the night alone in the Louvre? Well I have, and it was amazing! What was working with the Louvre like? And just what did it entail? Did you get access to the collection? Did you get to spend time there after hours? I was given a badge that gave me full access, meaning that I could go where I wanted, when I wanted. I took full advantage of that. There were a few constraints though, so for instance, I had to ask permission to go up on the roof of the Louvre. It’s pretty dangerous up there, so you can only go with two firemen who are used to it. From there, the views of Paris are breathtaking. The Louvre is world famous, but what was your relationship to the museum like? I had been to the Louvre, of course, like almost all French people have. In this scenario, I was able to lose myself there for days on end. That was the main thing. Not trotting from one room to the next like the visitors I mentioned earlier, but to be able to really sit down, and wander about, and hesitate, and go from Ancient Egypt to 19th Century French sculpture. Did you know that some rooms are always empty, even in the middle of the day? The Louvre is one big magical maze. The building itself is enormous. The works come from all over the world, as do the visitors. So yes, it is the world, in the best version of itself, the best it has to offer. Mr. Balouchi is one of those people—they do exist—who spend their retirement years at the museum. There are worse places to do that. Could you briefly explain the Académie Française joke at the end of the book? We don’t have anything quite so similar here in the US so I’m unsure how well it translates. The Académie Française was founded by Richelieu in 1635. This is where the French language is safeguarded by the greatest writers of the day. They’re called the Immortals. It’s a very French and slightly outdated institution that we love to make fun of here in France but that’s also part of our national identity. The way the Benion family see it, given that the Cross-Eyed Mutt, i.e. ugly work painted by their ancestor, has opened the door of the Louvre to them, they don’t see why his small body of literary work shouldn’t open the doors of the Académie Française to them as well. And since it’s just on the other side of the Seine, they go for it. Ha ha! Send me some photos, I’ll make sure to show them to the President of the Louvre! 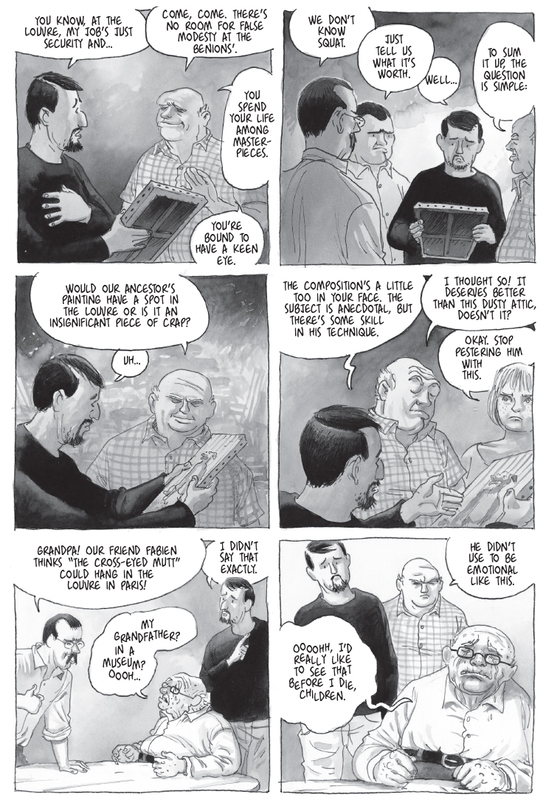 But seriously, we made the decision to include a small dossier at the end of the book that explains the museum’s process for selecting and acquiring works. The Cross-Eyed Mutt, i.e. the ugly painting trying to get into the Louvre though it doesn’t really fit in, is also, as far as I’m concerned, a metaphor for the graphic novel / comic book genre being granted access to the museum thanks to this series. In fact, there was actually a small exhibit about my book at the Louvre. Having a show at the Louvre… never in a million years would I have imagined that. This book came out in France a few years ago. What have you been working on recently? My next book is coming out in October. I did it in collaboration with a historian. It’s about what makes us French, and about our relationship with the history of France. It’s a story for which we did a lot of research and which is based on a lot of facts, but which is also done in a very fantasy kind of tone. Our “identity” as a country is a hot topic these days, and it was a big part of the campaign narratives during the last presidential election. There is no topic that the comic book genre can’t address.